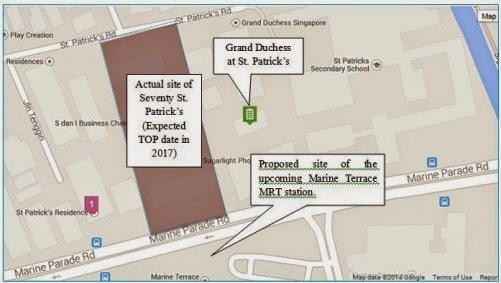 Seventy St Patrick's: More than 50% of units launched sold! This may already be "old" news (as the wife and I have just managed to get onto our laptop after spending the day running around in Jakarta) but BT has reported today that Seventy St Patrick's, a 186-unit freehold condominium located in the East Coast by developer UOL Group, sold around 100 units during its private launch over the weekend. Units were sold at an average price of $1,630psf. The smallest unit sold was a two-bedder for about $1.2 million, while the largest was a penthouse that went for around $2.4 million. Around 16 penthouses out of the 36 available were sold. Singaporean constitute around 90% of the buyers. Unit sizes for the development range from 700sqft for a two-bedroom to 1,647sqft for a four-bedroom penthouse. As a comparison, another freehold development nearby - St Patrick's Residences - had three units that changed hands this year at an average price of $1,226psf. The units sold ranged from 1,206sqft to 2,519sqft, according to data from URA. Seventy St Patrick's comprises nine blocks of five-storey building. It is being built on a site of about 140,000sqft along St Patrick's Road. Estimated completion of the project is end-2017. Marine Terrace MRT station on the recently announced Thomson-East Coast Line, which is scheduled for completion in 2023, is supposedly located near to the development. No Comment to " Seventy St Patrick's: More than 50% of units launched sold! "